Imagine you are about to roll up a nice fatty. You grab some bud and are about to pour it into your blunt when you realize that your flower is stale AF. What was once a voluminous bud is now essentially useless shake. While you may be tempted to chuck out your pot and render it garbage, you should hold off! There are many ways you can rehydrate your weed and give it new life. 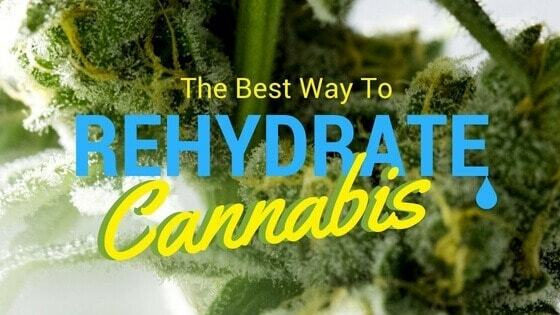 Let’s look at some of the best ways to rehydrate weed. One of the healthiest, and tastiest, ways to bring your herb back to life is putting with a fruit peel. Take a citrus fruit such as lemon, orange or lime and cut little rivets into the peel. This will bring out the oils (which are extracted to make essential oils) that live within the rind. Place the dried out cannabis into a jar with the citrus peel and close tightly. Let the two sit together for up to one day. Be sure not to wait much longer, because you don’t want the peel to grow bacteria. Any time you cut anything, it begins to oxidize, which is essentially the decomposition process. If the peel starts to rot, it will then contaminate your dried up plant matter. After the day is up, your bud should be rehydrated...and robust with citrusy flavors. If you wait to long to remove the peel, or add too many peels, you can make your bud too wet and you'll have to dry it out! Who doesn’t love a ganja sandwich? Take a slice of good ol’ American white bread (or sprouted whole-grain bread if you care about your health). Put your dried herbs into a plastic bag with the bread and seal it shut. Leave the two out on the counter overnight. The dried herb will extract moisture from the bread, rejuvenating the bud. Just like the peel, you don’t want to leave the bread and the pot in the bag together for too long. The longer the bread sits, it will begin to grow mold. Nobody likes to smoke dried out weed...let alone moldy, dried out weed. So, if you don’t want to alter the taste of your bud like the fruit peels do, there’s one last food choice to turn to. Lettuce is a great way to rehydrate your weed. Seeing as lettuce is 96% water, there isn’t much produce out there that can rehydrate like this salad staple. All you need is one leaf of lettuce. Put it in a bag with the dried out herb. Unlike the fruit and the bread, lettuce only needs 3 to 4 hours to work its magic. Lettuce oxidizes quicker than bread and fruit. So, if you leave it for too long, your lettuce and cannabis might get a bit funky. However, lettuce has a very minimal flavor profile. Therefore, you don’t have to worry about altering the taste of your weed with this technique. The best way to add moisture back into a dried out cannabis is by the addition of water. Here's an excellent way to give your marijuana water without it having to come into contact with other foods that may change its flavor profile. Put the herb inside of a glass mason jar and place the container on its side. Wet a sheet of paper towel and place it at the opening of the jar. Make sure that the weed does not come into contact with the wet towel! Place the lid on top of the jar and let the weed sit for a few hours. You will notice that the paper towel will get dry during that window. That’s because all the moisture transferred from the quicker-picker-upper onto the dried out bud. Sometimes, you are the company you keep. If a bunch of dry herb is sitting together, the rest will dry out too. However, to balance out the lack of moisture, you can add in some fresh bud. As soon as bud comes off the stalk, it’s very damp... too damp, in fact. Therefore, it is more than happy to share the wealth with its dried out counterparts. Mixing the two in an airtight container will allow for an even distribution of moisture throughout the plants. Also, this method may introduce more flavor into the dried out buds, without straight up altering the taste like food products may. While you can rehydrate weed with a litany of household items, there are also some products on the market especially made for this exact occasion. The brand Boveda makes disposable humidity packs. Just place these packs into a jar with dried out herb. The exterior of this packs allows moisture to flow freely. In turn, this creates more humidity throughout the jar. As you will notice, Boveda feels like a squishy pillow. You will know that the dry herb sucked the life out of it when the product becomes firm. There is no best way to rehydrate weed. In fact, all of these methods work great! So, depending on what you have lying around your house you can try the method that sounds the most appealing to you. If you have a problem with your cannabis always drying out, you should consider always having those humidity packs on hand. Preventing you cannabis from ever drying out in the first place is always the best defense.